Meet the Twitter bot generating unnervingly plausible think pieces. @thinkpiecebot: Sometimes silly, sometimes serious, always satirical. The term think piece isn’t new, but you might be forgiven for thinking it is. Few concepts seem more central to our present intellectual moment, and fewer still encapsulate that moment’s discontents with such terse precision. “These days,” David Haglund wrote in Slate last year, “when you want to mock a piece of writing, think piece—also written think-piece or thinkpiece—is the go-to term.” To call something a think piece is to suggest that it reduces critical thought to a clickable headline—opinion in place of argument, contrarianism in place of conversation. Here’s the problem: Any critique of think-piece culture—and there have been plenty of them—is bound to contribute to the category it challenges. Twitter, where pith is king, is especially subject to this paradox. On the one hand, its character restrictions encourage abbreviated terms like think piece that allow us dismiss an article without engaging it in detail. On the other, those same restraints make it an ideal venue for disseminating the very arguments its users so ably mock. 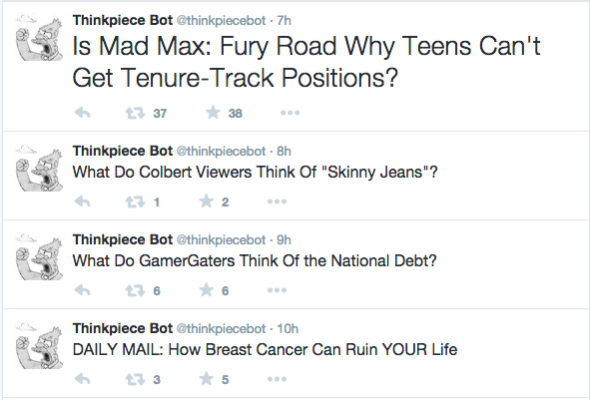 Enter @thinkpiecebot, an automated Twitter account that embraces this paradox with a wink and a smile. Created by digital artist Nora Reed, @thinkpiecebot draws on a repertoire of typical provocative subjects—chemtrails, sexting, and pumpkin spice, for example. Reed told me that she has the bot randomly insert items from these lists into constructions such as “Is [SINGULAR THING] Why [GROUP] Can’t [VERB THING]?” The results—pitches for essays that never were but sometimes feel that they could be—are at once familiar and alienating, perfectly capturing the formulaic vacuity of so many Internet-age articles. Reed has created a handful of other Twitter bots, many of them with similarly satirical intent, including one that invents terrible luxury products and another that generates bad ideas for startups. In an email, she described bots as a “kind of cultural criticism,” one that helps reveal narrative patterns but “also makes me laugh while I do it.” She told me that she likes the Twitter bot format in particular, “because tweets come up without you directly seeking them out.” It’s a form of satire that seamlessly weaves itself into the world that it’s satirizing. Reed, who is 27, says @thinkpiecebot arose out of her frustration with the way cultural commenters dissect her generation. “I keep seeing these articles about millennials that fit into two categories,” she wrote, “talking about how fragile and sheltered we are,and attempts to [explain] why we don’t do things that require money. …” While she designed @thinkpiecebot to mock such stories, she says that it also serves as “a coping mechanism” by allowing her to push back against a parade of reductive assumptions. Are Young People Getting High On "Oversharing"? In this regard, @thinkpiecebot shares a certain amount of its satirical DNA with Millennials to Snake People, the Chrome extension that, as its name suggests, replaces the word millennial with snake person whenever it appears on a Web page. As I wrote in in May, this extension and others like it are only pretending to mock millennials. Their real target is the way that the media reports on the young. These programs resist formula by pushing it to the point of absurdity. Is Sexting Why Millennials Can't Get Jobs? Where Chrome extensions mock linguistic patterns, however, @thinkpiecebot gets at the self-consuming mechanization of journalistic discourse more generally. The best @thinkpiecebot efforts are often those that tumble into a tautological delirium. “We’re Approaching The Y2K Bug All Wrong & How To Use The Y2K Bug To Fix It,” a recent tweet reads. Along similar lines, Reed told me that one of her own favorites was, “Cancer: The REAL Cause Of The Cancer Epidemic.” In their circularity, these tweets point to the self-referential quality of think-piece discourse more generally. Think pieces, Reed’s bot might tell us, are the real cause of think pieces.